I’ve just returned from running a workshop with the ‘switched-on’ people involved in the PowerHouse here in Perth. 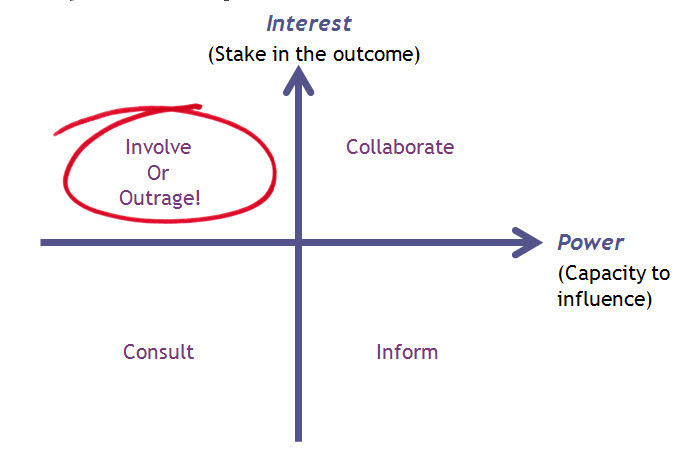 In looking at issues relating to Stakeholder Engagement, we focused on the value of Stakeholder Mapping. Doing this shows that ‘all stakeholders’ are not equal. Just think about this for a moment in terms of an issue you need to get stakeholder input on. There’ll be some people out there who are pretty passionate about the topic. Some less so. And some who either don’t care or don’t have the time to get involved. Stakeholder mapping helps you to identify where you should invest your time and efforts. There are a few models to use, today we used one borrowed from Dr Martin Butcher – shown below. He’s linked the model to the levels of participation shown in the IAP2 Spectrum of Public Participation. And if you’ve used this approach, please let me know how it went!